1. Make those little puppies far looser than you ever thought possible! In fact, when you think they’re loose enough, loosen them up a little bit more. It may be possible to make them too loose, but not in my experience (limited though it may be). 2. The directions instruct you to K1, yo in the stitch for a total of seven stitches. Debi suggested alternating K1, P1 instead. This works much better. It gives the bottom of the nupp a little stability for the return trip. It also seems to make for a neater, more compact nupp. Technically, this may make them more bobbles than nupps, if you really want to split hairs, but the difference is too minor for me to worry about. 3. Watch your stitch count! It’s easy on the purl row to pick up an adjacent stitch. It’s almost impossible to count the seven stitches, so just watch the stitch count before and after. 4. I’m knitting on size 4’s, but I’m keeping a size one double point handy for those nupps that I make just a little too tight. 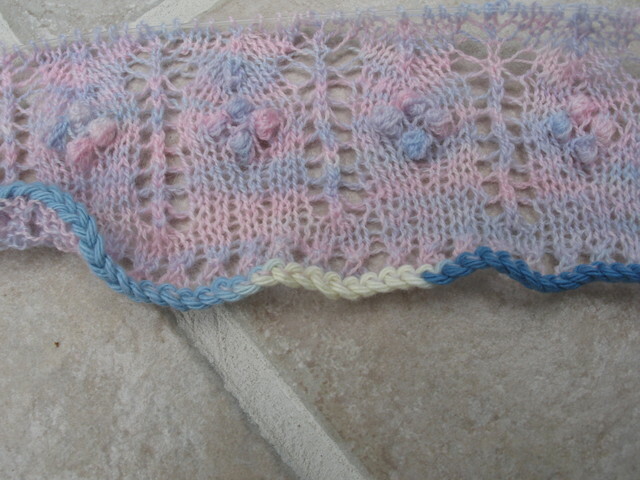 I can purl them with the size one and then slip them back on the size 4. But with practice, I’m finding I don’t need to do that too often. And without further ado, because I know you’re just waiting with baited breath . . . Nupps! This shawl is made in the Estonian manner, so this is the border, knitting outward, Soon I will, cast off, then pick up stitches from the provisional cast on and start knitting the body of the shawl, ending with knitting the second border. That way both borders are identical. I have never used a lifeline before – in fact, I had never heard of one until I started blogging. But if I am ever going to use one on a project, it would be here. We’ll have to see. When I finally did get the hang of nupps, it was like an epiphany and it’s gotten easier ever since. Maybe I’ll even pick up a little speed. And, in case you think St. Enda has been totally abandoned – I’ve made progress on the front. Our weather has been relatively cool lately, so perhaps I’d better knit on that before it becomes too hot. Nope, no nupps for me, but you can have fun with them! I’ve done a project with nupps – or maybe they were bobbles. When the project was done, I vowed I wouldn’t do another nuppy project ever. But now that I’ve seen your helpful nubby hints, I can feel that resolve relaxing just a little. Maybe in another ten years I’ll be ready.